Dosbat: Into the Hot Zone. On Friday the IPCC released the draft version of their new report: Special Report on Managing the Risks of Extreme Events and Disasters to Advance Climate Change Adaptation (SREX) PDF. The report relased is merely the Summary for Policy Makers (SPM), the full scientific basis report will not be released until early 2012. Much of the text concerns vulnerability and exposure to the risks of climate change, although there is a shallow but useful summary of the observations and projections related to climate extremes. RealClimate have already done a post on the findings related to Tropical Storms. I'm not going to go over SREX in great detail but a few points from it relate to the recent Hansen paper discussed in my previous post. "Funding will no longer go to those who are most at risk from climate-impacts and with low adaptive capacity, but will go to those who are lucky enough to live in regions of the world where weather extremes happen to be most attributable by climate models to human agency. These regions tend to be in mid-to-high latitudes, with lots of good weather data and well calibrated models. So, goodbye Africa." Economic, including insured, disaster losses associated with weather, climate, and geophysical events are higher in developed countries. Fatality rates and economic losses expressed as a proportion of GDP are higher in developing countries (high confidence). The release of the SPM SREX report explains why Hansen (and colleagues Ruedy & Sato) has come out with the recent paper that has so shocked me, again see my previous post for my comments on this. Their findings suggest that a key finding of SREX is conservative, that doesn't surprise me as the IPCC are consistently conservative as I've found when reading their Fourth Assesment Report, Working Group 1, The Scientific Basis. SREX finds that it is very likely that cold days have decreased and warm increased globally, and very likely that this has occurred in North America, Europe and Australia, whilst confidence in Asian warming is less. However there is only medium confidence that length or number of heat waves has increased, and this applies only to certain regions. Whilst Hansen finds that 3 sigma warm events (i.e. rare events with a warming more than 3 standard deviations from mean temperature) during summer now cover 10% of the globe (fig 5), an increase that is extreme and is shown in the skewing of the distribution of temperatures (fig 4). In Europe the extreme nature of recent summer heatwaves is also borne out by the findings of Barriopedro et al. They find the first decade of the 21st century has re-drawn the map of record summer temperatures. They use a combination of surface temperature data and multi-proxy reconstructions of past surface air temperature and use these to analyse the past 510 years of European temperature. Taking the period 1500 to 2000 they find that most of Europe had temperature records set in the 1800s to 1500s, however the same analysis from 1500 to 2010 reveals that most of Europe had temperature records set in the first decade of this century. In other words European warming now clearly exceeds that for the last 510 years due to records set in the 21st Century, this does not bode well for the rest of this century. Barriopedro et al also construct the temperature distribution for 1500 to 2010, this is presented in their figure 2 which is shown below. 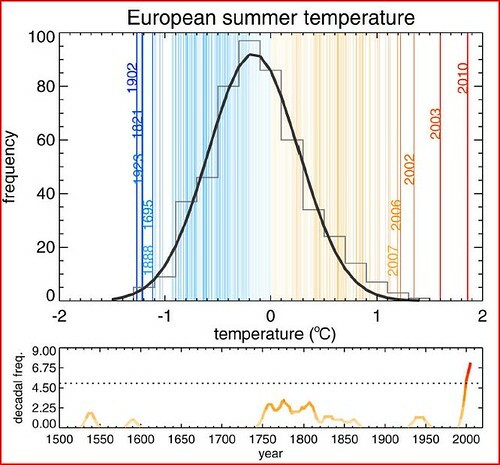 Barriopedro et al, figure 2, statistical distribution of summer temperatures for the period 1500 to 2010. In the above figure the grey bars are the statistical distribution of temperature from 1500 to 2010, the black line is a normal distribution fit to that distribution, this clearly shows that the normal distribution is a valid model for most of the data in that time period. What I find staggering is the position and timing of the 5 warmest and coldest years, the coldest years are well grouped, and within the normal distribution, whereas the five warmest years are from the last decade, widely spread, and as is explained in the paper all of the years of that decade lie in the top 5% of the distribution of summer temperature that would be expected by random chance. Barriopedro et al also find that even when the uncertainties in the proxy reconstructions are considered, at least 2 of the summers of the last decade (2003 & 2007) have likely been the warmest for 500 years. The above figure from Barriopedro et al can also be taken as independent regional confirmation of Hansen's global finding of a radical shift in temperature distribution. The occurrence of the five warmest summers outside of the envelope of former natural variability reflects the finding of Hansen of a substantial, decade on decade, upward shift in the high-end of the temperature distribution. In terms of the recent Hansen paper SREX figure 2 is of great interest. Climate Change drives changes in extremes, these changes can be connected with changes in the mean, variance, or shape of the statistical distribution. This is shown in SREX figure 3, which is reproduced below. 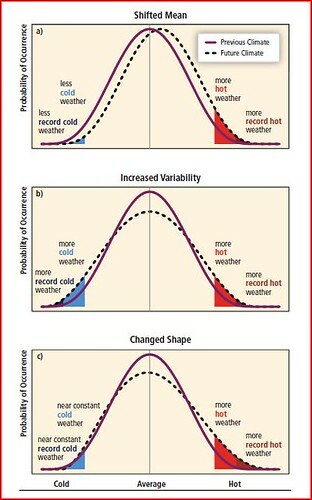 IPCC SREX figure 3, changes in the statistical distributions of temperature due to changes in temperature. changes in the surface energy and water budget (2, 29). That's a good start, but this issue is complex and it will take me some time to investigate further. For the moment it's worth noting that this apparent amplification of high-end variance seems to have been increasing during each of the last 3 decades, this does not look good to me. Many extreme weather and climate events continue to be the result of natural climate variability. Natural variability will be an important factor in shaping future extremes in addition to the effect of anthropogenic changes in climate. This sort of detail will be jumped upon by the denialists to produce confusion about the ongoing climate change. This is evidenced by an NOAA study finding that the Russian Heatwave of 2010 was caused by a blocking high. This is not arguable, without the blocking high there wouldn't have been an extreme heatwave, however all weather is now happening in a Global Warming world. Cattiaux, 2010, "Winter 2010 in Europe: A cold extreme in a warming climate" (PDF) finds that the best analogue in terms of atmospheric circulation for the cold winter of 2009/10 is the extreme winter of 1963, yet winter 2009/10 was not as cold as 1963. Similarly the 2010 Russian Heatwave took place against a background of not just global warming, but a substantial increase in the occurrence of high sigma warm events. So merely concentrating on the atmospheric pattern involved is not telling the whole story. For the denialists 'not telling the whole story' is part of their modus operandi. Barriopedro et al, 2011, "The Hot Summer of 2010: Redrawing the Temperature Record Map of Europe." PDF. Another good post. Until you mentioned that the top five hottest year were outside the ND I missed the real and somewhat frightening significance of the graph. Globally, most of the hottest years are all in the last decade or so. That being the case I don't think it would be amiss to conclude that Global temperatures will mirror the European example. Are you aware if a similar analysis has been done for global temps? No I don't know of any studies in other regions, Asia looks unlikely - SREX states uncertain (are sulphate emissions reducing insolation? ), Australia's possible, but the US hasn't yet risen conclusively above the 1930s (Hansen's paper - fig 7 I think). As for North America as a whole - perhaps warming in Canada and Mexico tips the balance, as for South America - I don't know. Hansen's study is global. In my last post I used part of figure 4, the legend of which states it's obtained using the local temperature anomalies divided by the local SD - this is done for the globe. Sorry, could have been clearer in the post. The Barriopedro figure above is for the average of the Europe area stated in the paper. Doing the same for the available global average temperature series would be trite as we can see visually GAT is already outside the range of natural variability. Actually looking at the distribution of red and brown patches in Hansen figure 3, and the trends of red (>2SD) and brown (<3SD) in figure 5, by the end of this decade virtually all of the globe should be showing significant increase in heatwaves.